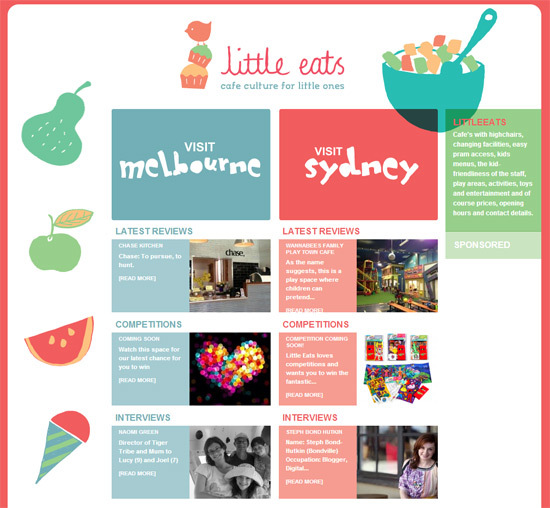 You may know already about the Little Eats website for Melbourne, but did you know that there is also a Sydney version? Little Eats is dedicated to profiling cafe culture for little ones in these two Australian cities. You'll find reviews, articles, competitions and interviews all about eating out with kids. Kid-friendly reviews include information those often overlooked but critically-important details such as pram access, kids' menu, change tables, high chairs, kids' activities and more. It's genius! And if you head over this week, you'll find my personal picks for child-friendly cafes in my neighbourhood. Thanks Little Eats for including me on your great site.